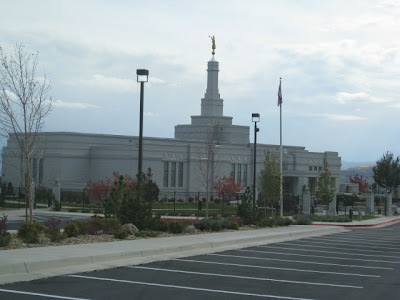 The missionaries are able to go to the temple quarterly. Those in the north area attend the Reno Temple and those in the south area attend the Las Vegas Temple. Because the Las Vegas Temple is outside the mission boundaries, those in the south depend upon members to give them rides to the temple. Members are wonderful to the missionaries. All 49 companionships were able to arrange for members to take them to the temple. The first group had to be at the temple at 6:30 a.n. and the second group at 7:30. We certainly do appreciate all the help that the members in this area give to the missionaries. A great daywas enjoyed by all! We decided it was time for the senior missionaries to have a chance to get together. This past Monday we got together for dinner and for a family home evening lesson. It was fun evening. Welcome...we are glad you are here! Elder Sanft arrived in the mission on Monday morning. He was due to come wtih the last transfer but because of some heath problems he had to stay in the MTC for a few additional weeks. We are happy that he is finally here! This weekend has been the America Southwest Area Mission President Seminar. Every six months these seminars are held at different locations throughout the America Southwest Area. This seminar was held here in Las Vegas. We had the opportunity, along with seventeen other Mission Presidents and their wives to be taught by Elder Tad Callister, Elder Stanley G. Ellis and Brother Tracy Watson. Elder Callister invited the Assistants and two Sisters from both the Las Vegas West and the Las Vegas Missions to participate in a panel discussing how to most effectively use members in helping to teach lessons, in fellowshipping and in other ways. The discussion was great and the missionaries were amazing in answering the questions that were asked. When we were in Reno last weekend we took the opportunity to visit some of the Elders at their apartments. What a great way to spend a few hours! We took some time to share with each other what we all had studied during our personal study time that morning We loved visiting where they live and were impressed to see how clean their apartments were. A few days after new missionaires arrive the companionships come together for a meeting to review what they should be studying during their personal and companion study time. The new companionship follows a training schedule that includes studying from Preach My Gospel, watching DVDs that have been provided, and applying the training model through role playing; to explain, demonstrate, practice, evaluate and repractice. they are on their way to having a great mission experience. Zone Leader Council is usually held the first week of each month. President Black and the Assistants train the Zone Leaders so that the Zone Leaders can go back and train the Zones and the District Leaders. Because transfers just took place there are changes that have taken place in the leadership of the mission. We have some new Zone Leaders and also a new Assistant. (Elder Conder was also taking pictures the day of transfers. I decided to post them all! We can't believe how fast six weeks can pass! missionaries as they finish their missions. for new adventures and experiences. The group of new missionaries coming in this transfer was small. However, for what we lacked in quantity we gained in quality! Elder Corvalan, Elder Farmer, Elder Buchkovich and Elder Layton went to a baptism where the missionaries forgot to fill the baptismal font. As fast as they could they filled the font using buckets, bowls and anything else they could find!